When I discovered beets in my CSA basket this week I figured I had two choices: toss them directly onto the compost heap or bake them into a cake. I don’t like cake and I don’t like beets, so I’m not sure what made me think I would like a cake made out of beets. Possibly it was the assurance that “even confirmed beet-bashers will love this cake” in the introduction to the recipe or the fact that my foodie friend Katie mentioned that she’d tried it and liked it, but I suspect it was the chocolate. Of all the ingredients on this earth, chocolate seems the most likely candidate for transforming beets from a mouthful of musty dirt into something that people might actually want to eat. People other than me, as it turns out. Because even though the puréed beets lend the cake a decadent moistness and a market-fresh sweetness not found in ordinary cakes, chocolate beet cake is still essentially chocolate cake, and I just can’t get excited about chocolate cake. Chris, on the other hand, likes chocolate cake an awful lot, so much so that when this particular chocolate cake refused to vacate the warmth of its pan (because I’d followed the instructions rather than my own better judgment) he suggested we simply scoop it out with a spoon. Cooler heads — the sort more concerned with photographing a cake than with eating it — prevailed and the cake was salvaged. Sort of. I mean, look at that thing. It ain’t pretty. But if we are to believe Chris — and he’s awfully reliable when it comes to things like chocolate cake — what it lacks in prettiness it more than makes up for in yumminess. We each ate a slice for dessert the other night and I’d have to agree: it’s pretty good. For cake. I’m aware that that’s not exactly a ringing endorsement, so consider this: when I left for work on Friday, work-from-home Chris was eating chocolate cake; when I returned fourteen hours later (after a day at work and a night out with the girls), less than a third of the cake remained and Chris was (ahem) eating chocolate cake. “That cake has beets in it, you know,” I revealed smugly. “No way,” scoffed Chris, taking another bite of chocolate beet cake. And it was not until I’d shown him the recipe and he’d googled “chocolate beet cake” to confirm the existence of such an abomination that Chris believed me about the beets. “Why must you put vegetables where they don’t belong?” he groaned miserably. Then he frowned at the cake, shrugged in resignation, and cut himself another slice of cake. And not a small one, either. 1) Scrub the beets with a vegetable brush and trim roots. Trim stems and save greens for some other use. (I’m not sure what other use, but I’m working on it.) Bring a pot of water to a boil and add the beets. Boil for 20-30 minutes, or until the beets are tender and the skins slip off easily. Let the beets cool a little, the slip the skins off under cold water and then purée the beets in a blender or food processor. You should have about 2 cups of beet purée. 3) Fill a medium saucepan about halfway with water and bring the water to a boil. Reduce to a simmer and set a heat-proof bowl over the simmering water. 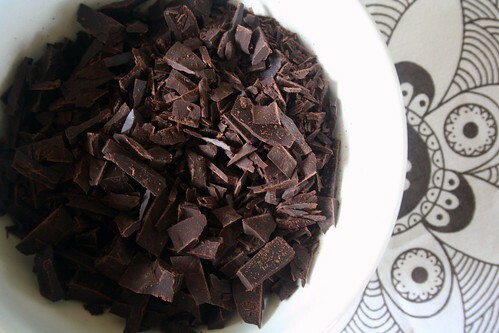 Place the chocolate and ¼ c. of the oil in the bowl and heat, stirring frequently, just until the chocolate melts. 4) Combine the eggs and sugar in a large bowl and beat with an electric mixer until fluffy. Slowly beat in the remaining oil, the chocolate mixture, beets, and vanilla. 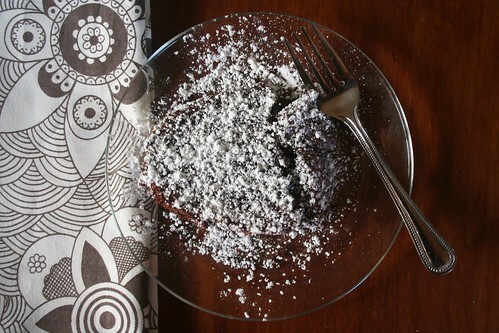 5) In a medium bowl, whisk together the flours, baking soda, and salt. Gently stir the flour mixture into the egg and chocolate mixture until just combined. 6) Pour the batter into the prepared pan and bake until a toothpick inserted near the center comes out clean, about 45 minutes. Remove the pan from the oven and cool on a wire rack for 30 minutes. 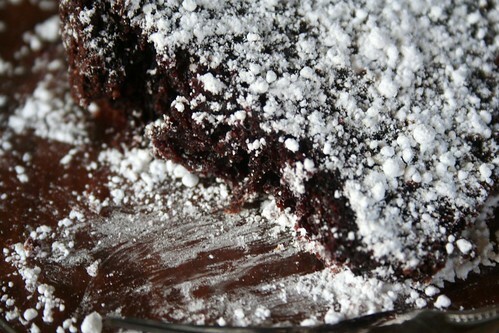 Carefully remove the cake from the pan and allow to cool completely before sprinkling with powdered sugar to serve. This entry was posted on July 12, 2009 by Megan @ When Harry Met Salad. 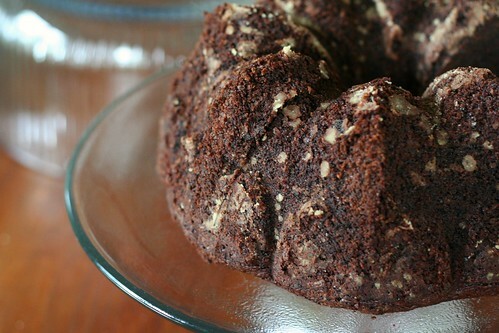 It was filed under baked goods and was tagged with baking, beets, cake, chocolate, chocolate beet cake, dessert, spring. We are a beet loving family. Every one of us loves them. My kids also love beet greens. I simply wash, chop and steam them. I even eat the stems chopped, but Thing 3 prefers the leaves and not the stems, so I give them to the chickens. I’m certain that beets not only add a healthy dose of fiber and moisture to the cake, but I’ll bet there’s a special sweetness added, too. you can also saute beet greens w. a little olive oil and garlic and they are very nice. I think I could totally get into beet greens, but we have been inundated with kale and I can barely keep ahead of it! One can only eat so many leafy greens, you know? Thanks for the tips, though. Maybe I can sneak some sauteed beet greens into something. . . Try kale chips–kids (and adult kids) LOVE them!! Y’all be crazy beets ‘n chocolate. 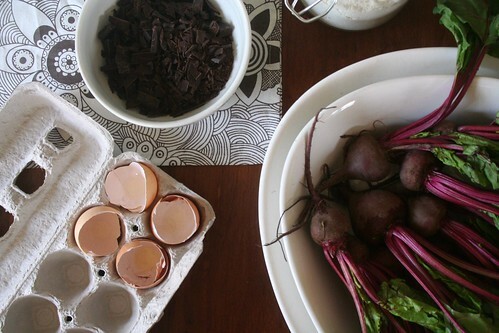 I adore chocolate, beets (especially roasted) and beet greens … an intriguing combo that I must try! Thanks for visiting, Megan … I’m getting very hungry reading your yummy recipes. This sounds pretty good, and I can get beets in Dhaka. Perhaps I will try it. I’ve never heard of this before but I love beets and I love chocolate cake so there you go. I know I would love this cake. Very nice! I don’t like beets, but they sure tasted a lot better in your cake, thanks for the recipe and a good way to get this vegetable down me! I tried this and from the flavor of the batter (I haven’t actually eaten the cake yet), I think the beet flavor is too pronounced. 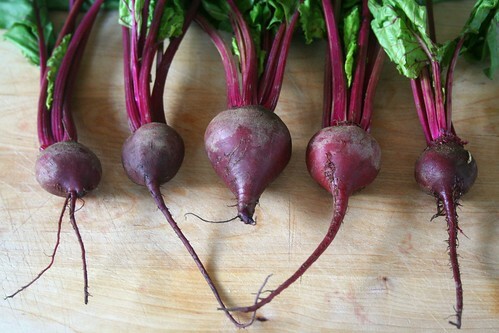 I must have had larger beets than you – the batter was maroon. 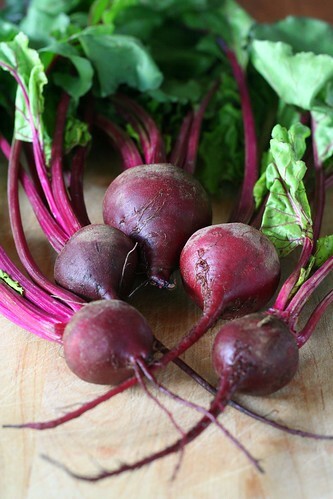 The size of the beets shouldn’t matter as long as you’re using 2 cups of beet puree as the recipe instructs. The batter tastes far more beety than the (cooled) cake, so I hope it worked out for you. I tried this recipe, and it worked really well. The cake was moist and kept its moisture over an entire week of being wrapped not particularly tightly in plastic wrap. My kids loved it. I thought it was chocolatey without being too chocolatey (if such a thing even exists). I would definitely recommend it. I used beet greens in place of spinach or collard greens in a veggie and cheese collard green roll recipe that I modified to stuff in pasta shells. Totally delicious! Even my non-veggie eating parents liked them. I’ve made this recipe at least 5 times since discovering it in August, and everytime I share it with someone else, there is a new convert to beet cake. Everyone LOVES it and no one can guess what the “secret ingredient” is. Incidentally, beet greens are awesome when prepared thus: chop some bacon, cook it in a frying pan until crispy, remove and drain on paper towel. Then sautee the beet greens in the rendered bacon fat and some garlic, and add the bacon crumbles back in at the end before serving. Delicious, complementary flavors. Case in point: THANK YOU for this wonderful recipe!!!! 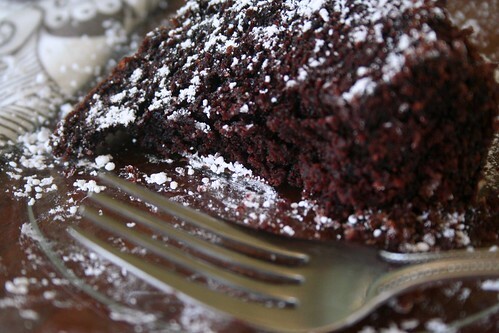 Hi.I googled ‘chocolate beet cake’ and I’m here. Because of the title of your blog. I love that movie so much.When I’m upset,when I hate everything around:) or when I’m bored I begin to watch it. And so I liked the recipe,too.I’ve made the chocolate zucchini,it was really good.I will do this tonight with my little –waited for a bit long in the fridge- beets. The title’s not the only reason that I’ve read your whole post.It was fun,you have an easygoing writing.I mean it’s not like a ‘everytime all the good things happen to me’ blogger writing.I liked it and I wanted to say. Note:Beet greens are lovely when cooked with onion,olive oil and bulghur.And garlic yoghurt on top. Roast them and put them smoothies. They add a beautiful color and delicious sweetness. Try yogurt, banana, blueberries, beets. Thanks for posting this recipe (so long ago)! I baked up half the recipe of this cake on the weekend, and it was delicious. The cake disappeared WAY more quickly than usual. I loved that it was so moist and not too sweet. Next time I might try smaller (younger?) beets since I could taste the earthiness in my cake. The recipe is definitely a keeper! !